Riddle of the lost city under a lake: Was one of Jesus' disciples laid to rest in ancient metropolis in Kyrgyzstan? Russian divers made the sensational discovery at Lake Issyk-Kul, where another metropolis was uncovered in 2007. The most astonishing discovery made by the divers was a piece of a ceramic pot with a stamp apparently inscribed in Armenian and Syrian scripts. This artifact could prove that there was an Armenian monastery on the lake where, according to legend, St Matthew's body and his many relics were buried. The Urantia Papers do not specify where Matthew's body ended up, but from Northwestern Turkey to Lake Issyk-Kul in Kyrgyzstan is about 4000 miles. 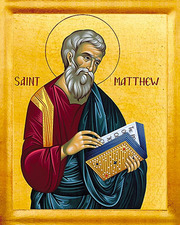 Senior Orthodox churchman Vladimir, Metropolitan of Tashkent and Central-Asia, is on record as saying: 'St Matthew died in Syria. 'His followers, escaping from Rome's persecutions, brought the relics of the Apostle to this land. Syria - still a long way. Hat-tip to "Dr. Varno" at Ace of Spades for link to Daily Mail article.